Korean Inspired Simple Roast Beef + a Le Creuset Giveaway! 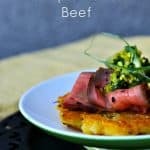 Love this Korean Inspired Simple Roast Beef? Check out our other fabulous Korean Food Recipes! Raise your hand if you’re on the hunt for a great appetizer for Thanksgiving! Raise your other hand if you want it to be something OTHER than turkey! I know there are a few of you out there who -like me- love that turkey, but need a little variety in the proteins at their Thanksgiving feast. This Korean Inspired Simple Roast Beef is JUST the thing to keep your holiday meals exciting. It’s versatile, too. You can serve it thinly sliced on Savoury Rice and Egg Pancakes (minus the cheese) and top it with Ginger Scallion Sauce as I have here, or you can slice thinly and serve with cheese and crackers, make lovely sliders with horseradish, or use leftovers with leftover sliced turkey for sandwiches, in pepper steak, or in fried rice. You start with a humble cut of beef -top round- sliced into 1 pound logs (a technique cribbed from the great Chef Michael Ollier of the Certified Angus Beef® culinary team) then dry rubbed in a mixture of brown sugar, salt, Korean chili pepper powder, and black sesame seeds and left to soak in all that goodness overnight. The next day, you simply quickly sear the beef in a cast-iron or heavy-bottomed skillet and roasted quickly to perfection in the oven. After roasting, it’s tented with foil and left to rest so the juices can redistribute. The whole searing/roasting/resting process takes about an hour. Easy, easy, easy! And oh, the flavours!!! The method behind taking such a humble cut of beef as Top Round and turning it into a succulent, tender roast is a simple one, but you do need to do two important things. 1) Cut the roast lengthwise (along the grain) into logs that are roughly 1 pound each. This gives you the surface area to let more of the flavours of your rub soak in AND gives you more control over cooking it. 2) When you slice the finished roast, you absolutely, positively MUST slice them ACROSS or against the grain. This shortens the fibers your teeth have to chew, making it more tender. It’s not-negotiable! The rub is comprised of brown sugar, kosher salt, granulated garlic, black sesame seeds, and Korean chili powder. None of these is expensive, but a couple are tough to find, so I’ve given you Amazon links to each of the trickier products. Resting the roasted beef is not negotiable! If you slice into it fresh from the oven, all the juices will run out and you’ll have dry, sad roast beef. Patience is rewarded! Cut the top round roast lengthwise into 1-pound(ish) logs. Set aside. In a small mixing bowl, use a fork to combine the brown sugar, kosher salt, Korean chili pepper powder, black sesame seeds, and granulated garlic. Rub it all over the the beef logs, put them on a rimmed plate, cover tightly with plastic wrap and refrigerate overnight. The next day, preheat the oven to 450°F. Position a roasting rack in a roasting pan and set aside. Heat the neutral oil in a cast-iron or other heavy-bottomed skillet over high heat until shimmering. Use tongs to gently lay the beef logs into the pan. It should sizzle audibly when placed in the pan. Let them sear for about a minute on each side, turning with the tongs, until the surface is brown in colour. Use the tongs to transfer the beef to the roasting pan. Roast for 15 minutes at the 450°F, then drop the temperature to 325°F and continue roasting until an instant read thermometer measures 120°F in the thickest part of the beef. Remove the pan from the oven and lightly tent with foil. Rest the beef for at least 10 minutes to allow the juices to redistribute before slicing thinly across the grain. Last month, I had the pleasure of traveling to Wooster, Ohio to spend a couple of days at the headquarters of Certified Angus Beef®. Several other bloggers and I had the opportunity to work with the fantastic culinary, creative, and public relations staff of CAB, picking their brains, cooking with them, and learning more about the 10 criteria that define Certified Angus Beef®. They even brought in their photography team to shoot some of the dishes we made. Have a look at what their team did to gussy up my Korean Inspired Simple Roast Beef! Did you know that they are not actually cattle ranchers and they’re a not-for-profit organization? Their raison d’être is to inspect and judge beef according to their stringent quality specifications ensuring that there is a product at market that consumers can trust to provide quality with every single purchase. You can read more about those 10 specifications and what they mean to you as a consumer here. The weekend was a riot and I learned an amazing amount of information that I’m looking forward to sharing with you over the coming months. I’m telling you, when you buy CAB products, you can rest assured both that you’re getting a great cut of beef (whichever cut you choose) and that you’re supporting some awesome people, to boot. Those same awesome people have offered an AMAZING giveaway package. One (1) Certified Angus Beef® Brand Cattleman’s Premium Collection Steak package containing a premium selection of four 12-oz. strip steaks, four 8-oz. filet mignons and four 10-oz. ribeyes and one (1) Le Creuset 7 quart roasting pan. Leave a comment on this post telling me what your favourite cut of beef is! Entries will be accepted through November 14th, 2014 at 10:00am EST. The winner will be notified by email and will have 24 hours to respond, or an alternative winner will be chosen. Disclosure: I was not compensated to develop this recipe or post this piece. 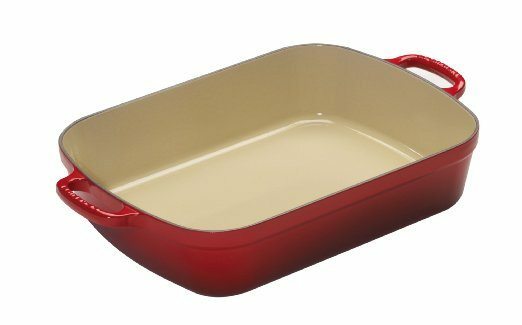 Certified Angus Beef ® gave me a Le Creuset roasting pan and has offered to give away a pan to one Foodie with Family reader. I am crazy impressed by their organization and the product they put their names on, otherwise this post would not be published! Big thanks to all the fine folks at Certified Angus Beef® and Le Creuset for this generous giveaway! This is my tenth post in my commitment to post every. single. day in November for NaBloPoMo (National Blog Posting Month). Follow the craziness all month as I share recipes, family anecdotes, and throw a couple of giveaways in for good measure! Since the weather has turned colder, we love beef short ribs! My most favorite cut of beef in the entire world is bone in rib eye. It has the best combination of fat and flavor. I love a good chuck roast for braising! I love chuck roast: stuffed with garlic and onions, made into a stew, beef and mushroom over egg noodles, shredded beef tacos, or The Pioneer Woman’s drip beef – there is so much you can do with it! I must say the Filet is my favorite cut and I like it medium rare…kinda just melts in the mouth! My favorite cut of beef is a ribeye. to cook at home, I love a good flank steak. So flavorful! But when I am out for a splurgy dinner, give me a rib eye every time! yum! Rib-eye for sure! My boyfriend is willing to grill all winter long (even in New England) and I am willing to let him! At home, I love flank steak (medium, sliced thin) for fajitas and to throw on top of salads. When I am out, nothing beats a beautiful filet mignon! It’s tough to narrow it down to just one cut, but I think I could eat a rib eye every day of the week…but who can afford that? So, braised chuck roast with mashed potatoes and a reduction sauce would be a VERY close second…..now I’m hungry. If it is celebration at our house, I would bet there is a flank steak on the grill. Bit if that celebration needs to be over the top (and for the adults in the house) a rare filet wrapped in bacon with blue cheese compound butter. My hubby and I love a thick rib-eye. I love a good, slow cooked, falling apart chuck roast. This time of year my tummy screams for fall root veggie pot roast dinners! That’s me trying to answer what my favorite cut of beef is. The safe answer is probably whatever cut I am eating at the moment. Do I remember that scene? Oh man… I can’t even count how many times I’ve reenacted that. 😀 And I hear ya. Beef. It’s good stuff. Right now, skirt steak for tacos! I live quite close to Wooster – welcome to our charming area of nowhere! My favorite cut of beef is, was, and always will be a nice juicy filet. Eye of round has always been my favorite cut for roast beef. Roasted medium rare and sliced super thin on my meat slicer it is absolute heaven on a plate! I don’t think you can beat the flavor of a bone in ribeye. Can’t go wrong with a nice tender filet. Ribeye! Love the fat content. Gotta go with chuck roast since there’s almost no way for me to mess it up. Short ribs, but flank cut. My husband loves Korean marinaded short ribs. I’ll have to try this with roast beef, I’m sure he’ll approve. My favorite is definitely the ribeye. Love this beautiful recipe! It’s so cool that you’re writing about an organization just ’cause they’re doing good work. Kudos! My favorite cut of beef is skirt steak! I’m a NY-Texas-NY nomad, but I surely miss fajitas now that I’m back ‘home’ in NY. I’m working on perfecting my own recipe out of desperation! I’m going back and forth between a NY strip and a bone-in ribeye. Pick my favorite cut of beef?? Just one??? I don’t think I’ve met any “beef” I didn’t like…but since you’re making me pick just one, I would have to vote for a delicious filet – grilled with salt, pepper, fresh crushed garlic, and melted butter. I can taste it now! I LOVE a good chuck roast. Cooked for hours in juices and wine and mirepoix? For this midwestern girl, there’s absolutely nothing better! Can’t wait to try this recipe! I’m making your Bo Ssam this Sunday! I love ANY beef, but when I get the chance (usually at a restaurant) I’ll get a rib eye or delmonico steak! 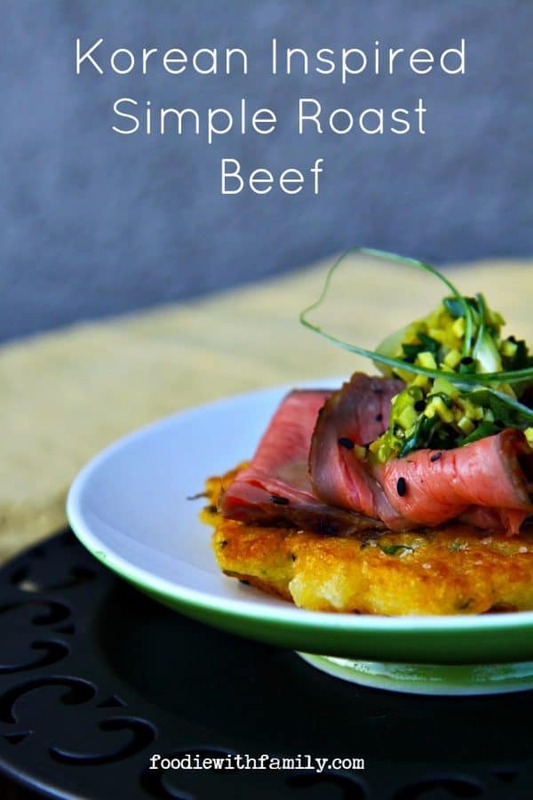 I am curious as to what your beef is sitting on top of in the photos … a potato latkes? Looks delish! I do like a good rib eye! I like chuck roast for beef stew. I made some last night in my pressure cooker and if was delicious. I love standing rib roast! My husband and I love the tenderloin. Hard to choose… I like the less well-known tri-tip, and ribeye is my favorite cut of steak, but for beef overall it’s hard to beat short ribs. Especially now that it’s braising weather! I cook a lot of chuck roasts. 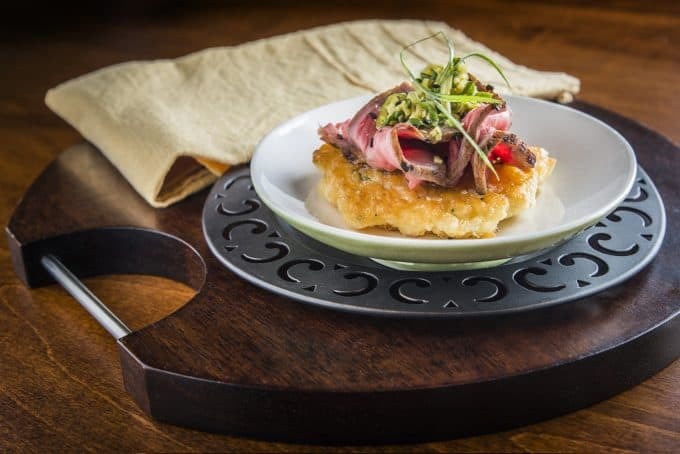 Love flank steak! And this looks amazing – hubbys favorite is NY strip. I love tri tip roast. It makes the best pot roast — the meat falls apart and tastes so good. Also grills up tender and juicy. Filet mignon is my favorite. No fat, super tender. Perfect. I love Tri-tip! It’s so juicy and tender when cooked right. Unfortunately, I can’t seem to find it very easily when I’m not on the West Coast….. I love a flank steak that has been marinated for hours and then grilled. Perfect for salads! Wow…. I love bone-in ribeye, tenderloin, flank steak, skirt steak, etc. Obviously, I can’t pick just one; I didn’t realize how much I love beef until I tried to answer this question. Something to ponder…. Wow! That roast beef is absolutely gorgeous!! Thank you!! And it’s so easy to make! I have successfully made 2 prime rib (bone-in) roasts on 2 separate special occasions with great success! That’s definitely my favorite cut of beef for feeding a crowd. My other favorite which is what I order in restaurants/steakhouses is ribeye steak, preferably bone-in, grilled, medium well, brushed with rosemary butter. Yes, I’m that specific! I adore sirloin steak. Seriously. It’s perfect. Gimme a side of mashed potatoes with it and we can be best friends. We just bought our second 1/4 of a cow from a local farmer. My favorite cut is the bone-in cross-cut shank. With it we make a very slow braised Osso Buco in red wine and mushroom sauce served with risotto. It’s hard to pick a favorite, but now that fall is in full swing, I’d pick chuck roast. Cooked long and slow, it breaks down the chewy fibers and fat etc. into unctuous, meltingly tender beefy deliciousness! Just made one yesterday as a matter of fact, and turned it into amazing taco meat. I am partial to a filet of anything. I love steak, and this recipe looks amazing. Filet Mignon has got to be one of the best cuts of meat on the planet. It’s just so perfectly tender, and, hello, BACON! To be perfectly honest, these days I’m in Love with about any cut of meat. The prices are so high, meat is something we have just about learned to live without~~~This is a wonderful contest, I Love “Foodie with Family”, and I really enjoyed reading the article about Certified Angus Beef~~!! Wishing everyone good luck in this contest, and Happy Fall~!! We like tri-tip on the barbecue with mesquite charcoal. A tasty rub and sliced against the grain for tacos with pico de gallo or sandwiches with horseradish on a ciabatta roll. Yum! Making my mouth water! beef short ribs! they’re so decadent and comforting, especially this time of year! That’s a hard one. For steak, porterhouse. For a roast, prime rib! My favorite cut is the versatile chuck roast. Pot roast, beef stew or beef-vegetable soup are all comfort food to me. I love beef so this is a hard decision but a New York Strip has to be at the top for me! I looove beef, especially prime rib! I like sirloin steak best. It’s the most versatile for me. My favorite is Tri-tip steak prepared with a rub/marinade and then grilled! Prime rib for me, but all beef is prime! I love pot roast! As a child I remember coming home from church on many a Sunday to that heavenly aroma. I like a NY strip steak. Truthfully, although I love beef and enjoy a steak on a rare occasion when eating out, our one or two beef meals a week are made at home with basic and inexpensive round steak. I slice it across the grain very thinly and marinate it for increased tenderness, then use a small amount in stir fries and pasta dishes, hot sandwiches on buns or flat bread or in tacos or in burrito bowls. Our budget is limited, but a little of this versitle cut goes a long way. I augment beef with mushrooms, beans and lots of vegetables, but my family hates to go without. Hamburger? Kidding. I’ve had filet mignon once. That was my fave. My favorite is Rib Eye steak cut. My favorite is short rib. I love a sirloin steak, medium rare. Just a little salt and pepper. Hubby likes a ribeye left on the fire a little longer. That korean beef is gorgeous! My favorite cut of beef is a Rib eye. I love roast too. My favorite cut of beef is flank steak. It is versatile, relatively inexpensive, and can feed the whole family. I love a good sirloin, and I would love to try filet mignon but I’m always too tight! 🙂 One thing about beef is a person can do a lot with the inexpensive cuts. I am a rib-eye gal and also love rib roast (who doesn’t)…but this rub is very exciting to me and I will try it on many different cuts of beef…so bring it on. Mostest likely a good ribeye steak would be my absolute favorite. Other than that, I love prime rib roast. But you can’t beat a good chuck roast – so versatile. I love beef! My favorite is a great grilled ribeye steak. On “leaner” months where ribeye aren’t in the budget, we buy a cheaper chuck eye cut and really enjoy it as well. Thanks for the recipe. It looks like one I’d like to try out. I’m a fan of a good ol’ ribeye steak! I’m partial to filet mignon, lol! My favorite is a 12 oz. New York Strip, rare, while my bride prefers medium rare rib eye. But I don’t remember ever turning my back on a well prepared piece of beef, from Kobe in Tokyo to burgers in my back yard. Any cut of steak will do for me. Rib Eye is my favorite – I love the marbling – although I more often cook flank steaks since they’re cheaper and so veratile. Any beef is good beef. I think ribeye is probably the tastiest steak, but I could eat hamburgers for dinner every day and still be happy. Thanks for the opportunity to win that great giveaway! A wonderful, tender, filet mignon, is hands down, my favorite cut of beef. I love tenderloin, broiled to just medium rare. Thank you for the chance to own this gorgeous roaster and some yummy steaks! I definitely like NY strip steak the most!It goes so well with so many side dishes. I am just beginning to learn to cook, so I can’t say that I have a favorite yet! I’m sure my husband does though, he’s a big steak eater! My favorite is the standing rib roast. I buy it every year at the holidays and serve it with garlic mashed potatoes and my current favorite veggie sides. My butcher cuts it off the bone and then ties it back on so I can roast it on the bone and slice it more easily. It is roasted med rare and everyone loves and looks forward to it. It is always a winner. I’m a filet girl but I would not turn your recipe down! I love this recipe – I still need to make those rice pancakes at home though! So much fun spending the weekend with you and everyone at CAB, hopefully we we will get see each other again soon! My favorite cut of beef is top sirloin – it’s fairly lean but oh so tasty! I wouldn’t turn down most steaks, but London Broil might be my favorite! The tenderloin is my favorite cut of meat.